So in my last post, I mentioned upgrading to a Nikon D7500. I wanted to write a little about the selection and buying process. How Much of an Upgrade Do I Need? While I had finally decided to upgrade my camera, it was clear I would stay in the Nikon D7x00 family because I needed to leverage my existing investment in APS-C lenses. Not that that was a bad thing. I've been very happy with my D7000. I think this series is a pretty ideal fit for me – someone who needs image quality and camera control, but isn't a professional and is working with a limited budget. So the only question was whether to upgrade to the D7100, D7200, or the latest model D7500. I immediately eliminated the D7100 because it didn't make much sense to invest a lot of dough in an upgrade and still be two generations behind. On the other hand, I don't necessarily mind starting out one generation behind if I can save a lot of money and the camera is reasonably comparable to the current offering. As it turns out, the D7200 is actually quite comparable, and even superior in a few respects, to the D7500. So it came down to those two cameras. Now, there's been a lot of hand-wringing over features in previous D7x00 series cameras that Nikon elected to no longer include in the D7500. Namely, Nikon went with a lower-resolution sensor, a single SD card slot, no provisions for a battery grip, a lower dot resolution LCD, and no AI lens indexing. I do have opinions about Nikon's decisions, how much they actually matter, and about the sturm und drang those decisions elicited in certain Internet photography circles. But I'm going to avoid wading too far into those waters and just stick to how the upgrade choice played out for me. I was able to make the decision pretty objectively by just sticking to my own experience and knowledge and not getting caught up in everybody's amped-up opinions. I understand technology at a fairly deep level, and I've been shooting long enough now that I don't really need other people to tell me whether a feature matters or not. Especially when people's understanding of these features is often seriously flawed, or they're projecting their camera usage habits/needs onto to everybody else. Don't care – The advantage doesn't affect me, or its impact is so minimal as to be negligible. Care A Little Bit – The advantage does matter to me, but it has only a small impact on me and the way I shoot. Care A Lot – The advantage is highly impactful to me. The plan was to add up the scores for each camera and see what I had. There were a fair number of advantages that I rated as "0" – Don't Care. But the D7500 has a lot of little improvements (and a few big ones). It was racking up a lot of 1s. In fact, halfway through the exercise I realized that the D7500 had a bunch of little things that all together added up to a lot. 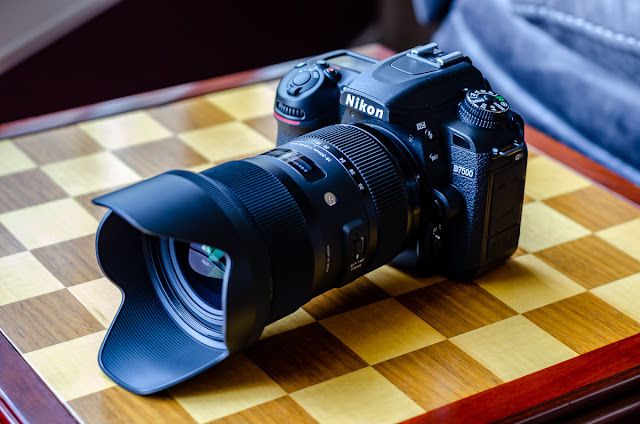 Now, the D7200 had some advantages too which you can see in that Photography Life comparison, but there weren't very many and they weren't very high impact to my photography. On balance, it was obvious that the D7500 was the better camera for me. In my last post, I talked about that heartless, adult supervision kill-joy, The Accountant. Although this purchase was all about satisfying the Artist, the Accountant did contribute one key decision that actually improved things for The Artist: I bought a refurbished D7500. My old D7000 was purchased used from a guy on Craigslist, which can be the worst way to buy something. Yet that turned out to be a great decision. So I was already comfortable with the risks of not buying a brand new camera. But a manufacturer refurbished camera seems to me to be a good way to go. First, a lot of refurbs are just returns – the product is fine, the buyer just had a change of heart. Also, manufacturers throw out products that are seriously damaged. The rest go through a lot of testing before being resold because processing returns is expensive and it's cheaper to do some testing to minimize them. In fact, unlike brand new products in which only a small number of samples are selected randomly off the assembly line for testing, all refurbs are tested. So a refurb is likely to have gotten a lot more individual inspection than a brand new product. Add to that the 20% savings I got off the new price; the retailers 30-days-no-questions-asked return policy; and the manufacturer's warranty; and I felt pretty secure buying the refurb. We'll see how it works out though. You never know.